Escape instantly into the Aston HT642B-F dual-insulated hot tub spa in Blue Quartzite shell and Redwood wood grain cabinet. This luxurious 6-person spa features 30 jets, a digital user interface display, built in light and one 2-speed 2.0 cHP jet pump. This unit also a relaxing lounger & spacious layout that seats 6 total. The HT642B-F is affordable hydrotherapy in a stylish and sophisticated design. Includes a marine grade UV-resistant vinyl cover. This model includes an industry-competitive warranty. The Swift Current V2 is one of the deepest portable spas on the market with a depth of 29 inch so adults can completely submerge their shoulders and neck for a truly relaxing massage. Its unique design makes it easy to assemble and the perfect addition to your patio, backyard, or cottage. Everyone will enjoy the 125 air jets as they help relieve the stress and tension of everyday life. This spa plugs directly into any standard 110V household outlet so no electrician is required. The Swift Current's energy-saving foam wall, thermal blanket, and lockable 6-inch inflatable cover ensures maximum insulation and security. It comes with an external Portable Control Unit that is equipped with a filtration housing and control system. A magnetic pump paired with a 700-watt heated air blower makes this spa energy efficient, and still allows the water to be heated to 103F (39C). Our updated PCU allows you to conveniently choose between 3 jet speeds, and includes an aromatherapy unit. LS600DX 7-Person 65-Jet Spa with Heater and Ozone Water Care is rated 4.8 out of 5 by 4. Rated 5 out of 5 by RoyCS from great spa and a tremendous value We have had this spa for two years now and have been very happy with it. In my research prior to purchasing I learned it is rated as very energy efficient (listed on the California spa energy usage guide) and as far as I can tell it likely has increased our electricity bill by around $20-$25 per month. It heats rapidly and can be used within 18 hours of filling. You can only use half the jets on high at any given time but that doesn't bother me nor does it affect the enjoyment. I highly recommend this spa to anyone looking for a mid-size (4-5 person) spa. 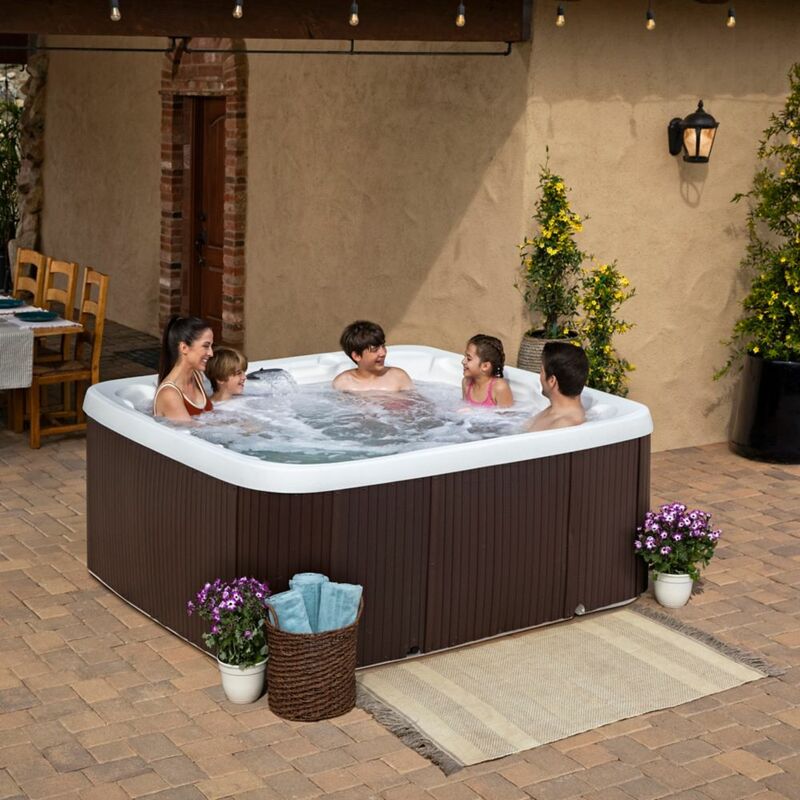 Rated 5 out of 5 by Powerhouse Retreat from Good basic hot tub I have had this tub for a month and it has been great, we have it in our rental unit and are very happy with it. It doesn’t have a lot of features which is exactly what we were looking for. Our guests have all been satisfied with its performance. Rated 4 out of 5 by Suzagirl from Tub is good but service sucked The tub runs great and is not too big and not too mall. HOWEVER it is listed as a 50 amp online, then a panel in it says 40 amp and another 20 amp so it was annoying. The service centre was also terrible to work with and very rude when I called. Rated 5 out of 5 by Builder from So far it’s great We’ve had it a month and couldn’t be happier with it.We’ll see come winter.